THE one wacky legacy of Ewen McKenzie’s reign at the Reds was rewriting the role of No. 13 to the point that the classical outside centre almost became extinct. As the new Wallabies coach, he has the chance to reinvigorate outside centre as a truly attacking, line-breaking hub of the backline in the run to the 2015 World Cup. He has inherited a class act there in 80-Test stalwart Adam Ashley-Cooper yet there is an irresistible case to experiment at some point with ACT Brumbies young gun Tevita Kuridrani. 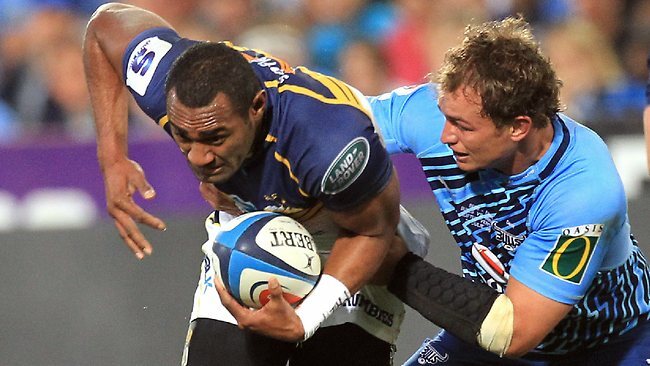 Kuridrani, 22, has been a revelation for the Brumbies in their remarkable run to Saturday night’s Super Rugby final against the Chiefs in Hamilton. He was in the Brumbies’ upset of the British and Irish Lions in Canberra last month and again in the bigger boilover early Sunday morning (AEST) when the Bulls were toppled 26-23 in Pretoria. It wasn’t just the Fijian’s presence to loom on the inside for the great escape try 90 seconds from full-time. He’d already broken tackles in two runs within minutes of each other just before half-time and smashed a turnover out of rival centre JJ Engelbrecht with a well-timed tackle. The smart angle of that first run and his support line for the try must have stirred a shout of glee from Jason Little, Daniel Herbert, Stirling Mortlock and Ashley-Cooper. That quartet are the only outside centres of class and size produced by Australia over the past 30 years. Kuridrani runs straight and makes his 102kg count. Happy days. A classical outside centre. His potential laps the impact of a Rob Horne, whose one-year ARU contract extension on Sunday was a leftover from the Robbie Deans era. McKenzie used Anthony Faingaa and Ben Tapuai as centres in the 2011 Super Rugby final when they masterfully blotted out the threat of the bigger Sonny Bill Williams and Robbie Fruean. Faingaa (16 games) and Tapuai (8) are both at their best as inside centres yet McKenzie used them more at outside centre in 2012-13 than any other options at the Reds. Line-breaking was always down from No. 13 as a result although Faingaa’s wide breakdown skills and Tapuai’s well-rounded game generated plusses in other areas. “Powering up” outside centre is exciting. Where once Ashley-Cooper was a lone wolf, Kuridrani and young Red Chris Feauai-Sautia, who McKenzie did blood there, are now exciting back-ups. “Epic” is an overused word but that truly was the magnitude of the Brumbies triumph and the expertise of coaches Jake White, Laurie Fisher and Steve Larkham to put it together. Fisher is an unsung hero. The technique and ferocity he instils in everything the Brumbies do when contesting the ball in the collision zone is superb. South African White has always been a coach from the top shelf. He injects attitude into every team he has guided and that is what stormed one of rugby’s fortresses. It was the Brumbies’ peerless attitude. He may not be coaching the Wallabies but is giving steel to those who will be playing. After the ignominy of being yellow-carded as a scrum flop in the recent Lions Test series decider, Ben Alexander showed enormous character to dominate there and earn penalties for his side. Man-of-the-match flanker George Smith was inspired and influenced the match as much as in any he has played since his debut in 2000. Halfback Nic White is now clearly Will Genia’s understudy and young prop Scott Sio, just 21,will become aWallaby during The Rugby Championship. As for Fijian winger Henry Speight, McKenzie will have to hold his breath until September to get his hands on him when he’s eligible. His fend, power run and flip pass to set up the early Jesse Mogg try was a rival for Israel Dagg’s semi-final gem for the Crusaders and that is saying something.